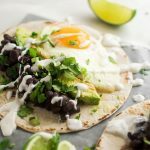 These vegetarian tacos feature delicious spicy black beans and fried eggs for a hearty Meatless Monday meal! This easy vegetarian breakfast recipe is filling, flavorful, and ready in just 30 minutes. But for real, let’s turn on some Adele and talk about these breakfast tacos. I thought for awhile about which breakfast taco features I most wanted to highlight, but there are just so many THINGS to say about them that I couldn’t decide where to start. I think that’s a pretty good start, eh? I really do love these breakfast tacos. 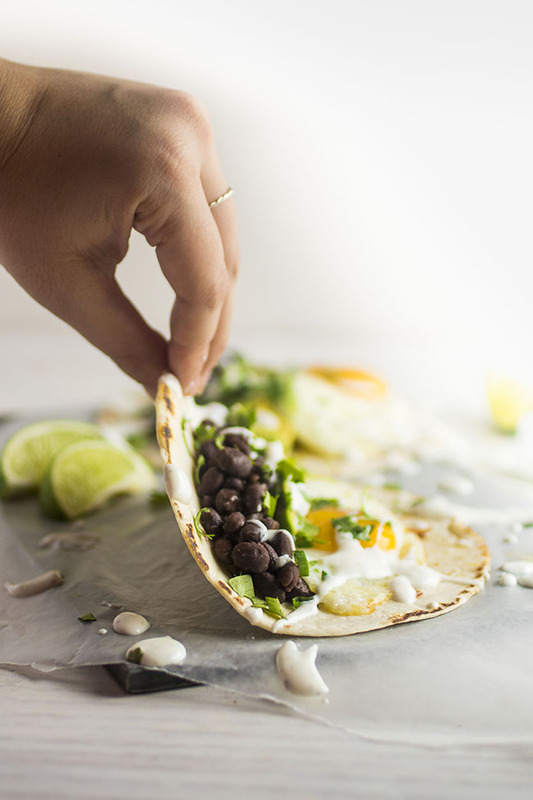 They’re filling enough that you won’t even miss the meat, and the black beans have juuuuuust a hint of spice that rounds out the brightness you get from a lime crema, fresh cilantro, and crisp green onions. Because of the runny, creamy egg yolks (which I wholly and completely recommend) these ended up being more of a fork-and-knife breakfast taco situation for me, but I didn’t mind it at all. 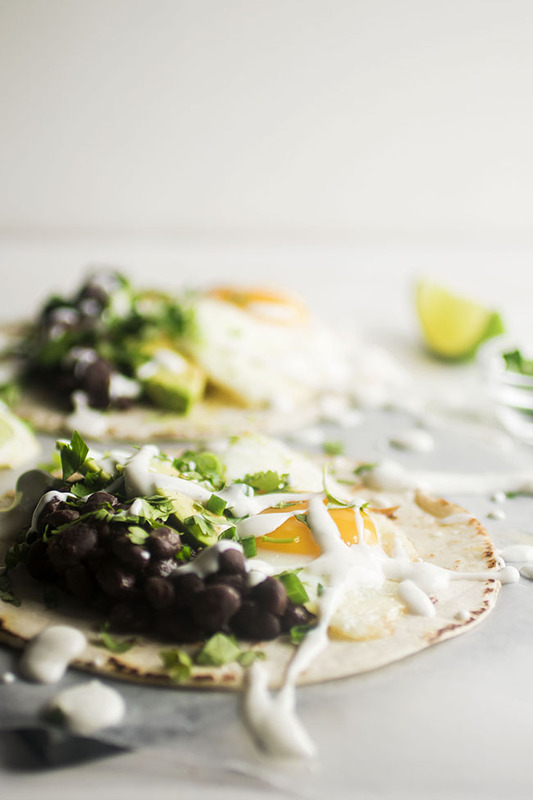 You could even crisp up the tortilla and do these tostada-style if you’d like, or (if you’re not a runny egg person) nix the over easy eggs and go for scrambled or over hard eggs instead. Also, I’m sort of losing it over how colorful these are. 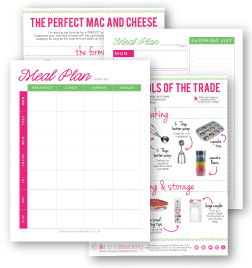 I’ve been trapped in a world of dark, boring winter food for too looooooong, you guys. So the green and yellow and fresh-fresh-freshness of these tacos is making me oh-so-happy. And I’m pretty sure they’ll make you oh-so-happy too ☺. 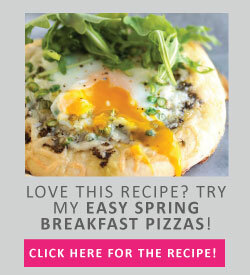 An easy vegetarian breakfast idea. In a small saucepan, heat oil over medium heat. Add garlic and jalapeño and sauté for a minute or two until garlic has softened. 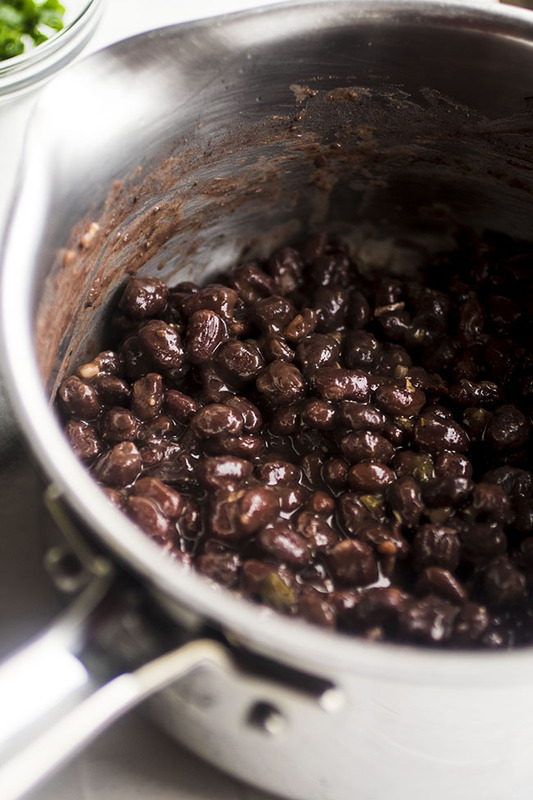 Add black beans, ground cumin, lime juice, salt and pepper to saucepan and stir to combine. Reduce the heat to low and cook, stirring occasionally, for 10-15 minutes while you prep the rest of the taco ingredients. Whisk greek yogurt, salt, pepper, and lime juice together in a small bowl. Set aside. Heat a large cast iron skillet over medium-high heat until it’s piping hot. Put tortillas into the hot skillet one at a time and cook for 4-5 seconds on each side until they’ve warmed and charred a little bit. (If you have a gas stove, you could also do this with an open burner flame). Melt butter in a large skillet over medium heat (you can use the same cast iron skillet from the last step, but let it cool down for a few minutes in between steps so the butter doesn’t burn). 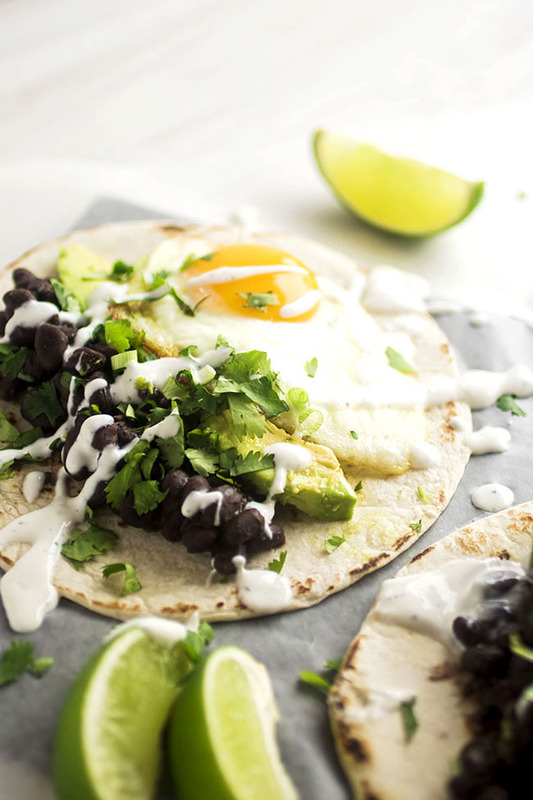 Top each tortilla with a big spoonful of your black beans and a few slices of avocado. Slide a cooked egg onto each taco and top with a dash of salt and pepper. 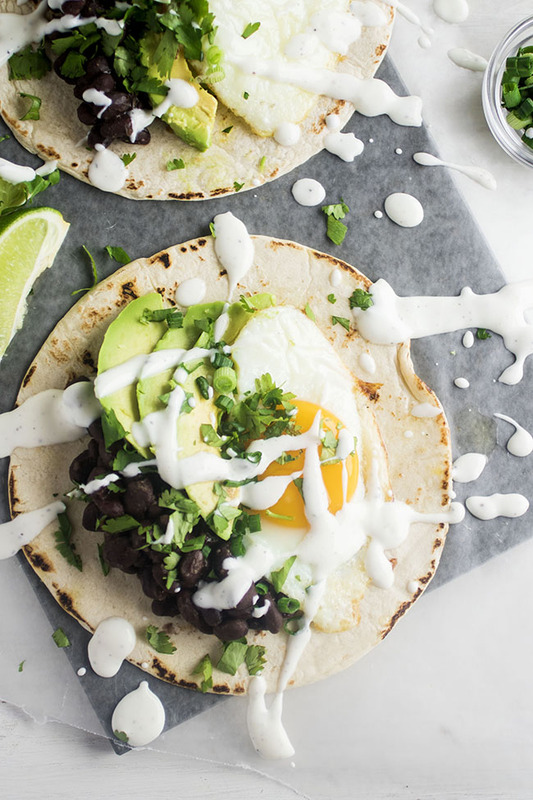 Top each taco with cilantro and green onions, and drizzle with a generous spoonful of lime crema. Serve immediately. Adjust the amount of minced jalapeño in the black beans depending on your spice preferences. 1 teaspoon – depending on the strength of the individual pepper you’re using – generally gives a nice, subtle heat, but if you love spice feel free to dial it up a bit! For a little extra spice, drizzle your breakfast tacos with a bit of Sriracha or other hot sauce. These tacos would also be great with some spicy chorizo! If your crema is too thick, whisk in a splash of milk or a little more lime juice to thin it out to your desired consistency. You don’t HAVE to use a cast iron skillet in this recipe, but I find it does a better job of getting a nice char on the tortillas than other types of pans. This looks fantastic. I’m unclear on the portion size. It says it serves 4. Does that mean it makes four tacos? Or feeds four people? How many tacos make a serving? I’m on WW. Thanks! This recipe makes four tacos, one taco per serving. Hope that helps!